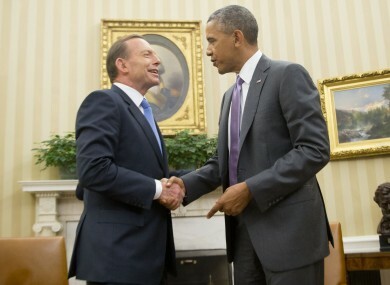 File photo of Australian Prime Minister Tony Abbott with US President Barack Obama. AUSTRALIAN PRIME MINISTER Tony Abbott said today his country would deploy 600 troops to the United Arab Emirates to join the US-led international coalition gearing up for war against Islamic State jihadists. Abbott’s announcement comes two days after Canberra lifted its terror alert level to “high” on growing concern about Australian jihadists returning from fighting in Iraq and Syria. Abbott said the deployment of about “400 air personnel and about 200 military personnel” followed a formal request from Washington for Australia to contribute to the international coalition against the rampaging Islamist group. He said Australia was “not deploying combat troops but contributing to international efforts to prevent the humanitarian crisis from deepening”. “There are obviously further decisions to be taken before Australian forces will be committed to combat operations in Iraq,” Abbott told a press conference in Darwin. The US has been working to forge a coalition against IS jihadists in Iraq and Syria, with Secretary of State John Kerry in the Middle East to shore up Arab support. The Australian deployment to UAE — a staging post for the country’s military operations into the region — will include eight RAAF F/A18 combat aircraft, an E-7A Wedgetail Airborne Early Warning and Control aircraft, and a KC-30A Multi-Role Tanker and Transport aircraft. The defence force was also preparing special forces soldiers to serve as military advisers to assist Iraqi and other security forces tackling IS, the prime minister added in a statement. Abbott said the deployment was focused on Iraq and not Syria. “At this point in time, Australia is not intending to operate in Syria,” he said. The Australian leader added that if combat operations took place, they could last “months rather than weeks, perhaps many, many months indeed”. The decision was backed by Labour opposition leader Bill Shorten, who said in a statement he was “reassured that our support is being provided at the request of, and in full co-ordination with, the Iraqi government”. But Greens senator Scott Ludlam warned Saturday before the announcement that greater Australian involvement in the Middle East could increase the possibility of a domestic terrorist attack. John Blaxland, a military expert at the Australian National University’s Strategic and Defence Studies Centre, cautioned Australia was committing “a large chunk” of the defence force “and we haven’t thought through the ramifications both in the Middle East, in our region, and also domestically”. “There’s a limit to what we can do effectively, and by doing as much as it looks like we are going to do, and perhaps more in the Middle East, we are opening up for things to happen in our neck of the woods,” Blaxland told Sky News. Australia joined the US in an international effort to transport weapons to Kurdish forces fighting IS extremists in northern Iraq. It also conducted humanitarian air drops in besieged Iraqi towns. Email “Australia sending 600 troops to join US against Islamic State - but not for combat”. Feedback on “Australia sending 600 troops to join US against Islamic State - but not for combat”.